Talk about quick! This is an instant soup, but unlike the traditional miso, it's chockful of perfectly cooked veggies and tofu. Well, "cooked" might be a bit of a misnomer, as this entire dish is made in the microwave. In a large bowl, just add a packet of instant miso, water, broccoli florets, sliced mushrooms, and sliced ginger if desired (I didn't have any, so I added a bit of ground ginger instead). After three minutes in the microwave, add some baby spinach and cubed baked tofu...and then 30 seconds after that, it's done! 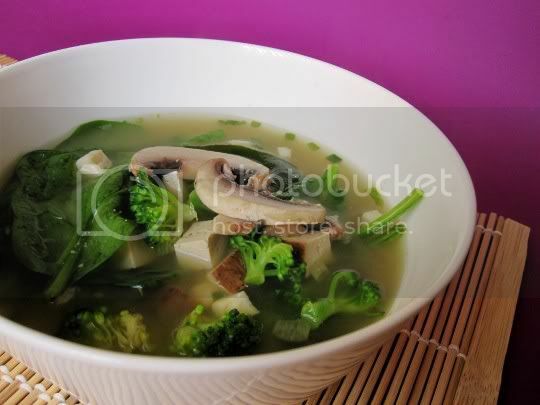 Texturally, this is quite a bountiful soup: the broccoli is firm yet tender, the spinach is just barely wilted but soft enough to chew, and the tofu adds some chewy meatiness. Yet even with all these veggies, the soup isn't very filling, and really is best served as a quick appetizer course. You could try doubling the serving size (because four servings of this soup are quite small), or hell, even the recipe. Also, because this is microwaved, it doesn't stay hot for very long, so eat up! Make again? Maybe. It's really just miso soup with some veggie tossed in. Nothing fancy, nothing complicated, but good flavor and healthy!